My biology lecturer has stated that since the early days of Millers amino acid experiment we have discovered natural processes on earth and in stars can make amino acids for proteins, sugars for DNA, complex carbohydrates and on and on, so no god is needed to make life because given long enough life must happen in the right circumstances. I have checked the references and it seems that all these biological chemicals really have been made or have formed in natural type experiments just like she said, so is it true that we do need a creator to make life? Can you help me in this whole confusing situation please? Speaking as a professor of chemistry, the evolutionary explanation of biogenesis flies in the face of what every hard working synthetic chemist does for a living, and runs counter to thousands of failed experiments to create life. There is absolutely NO evidence that simple chemicals have spontaneously reacted in the past (or can spontaneously react now) to generate more complex chemicals which eventually self-created a cell. Even today with all our million dollar instrumentation and finely honed chemical reactions, we can’t artificially make a simple cell on purpose! So what chance is there then that this whole process happened by itself? That is a rhetorical question to the unbiased. And it is a faith statement for the evolutionist. Evolutionists simply believe the cell happened through random chemical reactions. What we know for sure is that all known experiments to make simple chemicals demand that a scientist (a creator) is needed to control the concentrations, order of addition, temperatures, time and purification methods. But to imagine an entire cell with its mind blowing complexity forming by trial and error over time is without experimental support. It is a statement so far removed from reality that I am hard pressed to come up with an analogy which is equally devoid of supporting evidence. Perhaps believing that every car in the world came about by random chemical reactions of metal, crude oil and sand would be a start. The story of chemical evolution is simply a faith statement. I have a certain amount of faith but not that much. Let me explain. No matter how much applause is given to Miller’s amino acid experiment in biology texts, the reality is that not every amino acid needed for life was made by this experiment and perhaps more importantly, the amino acids generated were racemic mixtures (except for glycine which is achiral). This is a crucial point. For the non-chemist let me explain the very important terms “racemic” and “chiral” and then add a diagram to assist. Imagine a plum with 4 evenly spaced toothpicks in it. Let that be a carbon atom making 4 bonds. On toothpick 1, stick a raison. Toothpick 2 gets a pea. Toothpick 3 gets a grape and toothpick 4 gets a cranberry. That’s pretty much how a carbon atom could bond to 4 other atoms (pea = hydrogen atom, grape = chlorine atom etc.) This edible array has a mirror image. You will find that the two mirror image versions can’t superimpose so they are different shapes. Try it and you will see. We say that each version shape is chiral (has a non-superimposable mirror image). A molecule with a carbon atom having 4 different atoms on it can be chiral and if both molecular versions are present then that is a racemic mixture of molecules. If the carbon atom doesn’t have 4 different atoms attached then the molecule can’t be chiral (achiral). Each chiral version will have the same chemical properties even though they have slightly differing shapes. The simplest analogy is that your left and right hands are mirror images of each other, but they are not exactly the same. Try putting your right hand into a left hand glove – feels uncomfortable doesn’t it? That’s because your left and right hands are chiral. 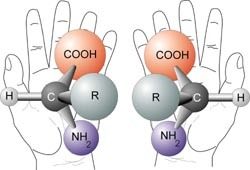 Amino acids are chiral, and the two forms are sometimes called left and righy handed, as in this illustration. If you have both chiral versions of a molecule (racemic) then the cell can’t use the racemic mixture to make the biomolecules needed to live. Chiral molecules which exist as a racemic mixture can’t be used to make larger molecules to run the cell. It’s a death sentence. When chiral molecules are made by natural chemical processes, as in Miller’s experiment or the chiral chemicals found in meteorites, they are always racemic mixtures and that is a huge problem for abiogenesis. Bottom line: Miller’s experiment didn’t make every amino acid needed for life; the ones that were made were racemic mixtures and they do not support life. As for sugars, I remember reading a paper about ‘sugar predecessor carbohydrate’ molecules being isolated from meteors but it turned out they were not sugars just simple 3 carbon units. Chemicals do react with each other just as paint sticks to a canvas. But does anyone claim that the Mona Lisa came about by the wind blowing separate droplets of oil and puffs of powdered pigment at a canvas through time? The painting required a painter. Yes, you can make sugars with the right type of designed experiments, carefully controlled conditions and smart scientists controlling everything, but evolution can’t invoke any of that. All forms of naturalistic evolution are based on the belief that simple chemicals have formed and self-reacted to make complex biomolecules to create the first viable cell. None of that last sentence has ever been confirmed despite thousands of experiments designed to do exactly that. I will close with this. I have spent the better part of my life learning how/why chemicals react (I am a PhD synthetic chemist). Our best efforts under carefully controlled conditions can only create moderately complex chemicals. Our experience shows that manufacturing complex bio-compounds requires an intelligent creator scientist and we can only make the simpler molecules. Now connect the dots when considering an entire viable self-reproducing cell which is so jam-packed with complex information that our best efforts do not come close to reproducing what a bacterium can do every 20 minutes – completely duplicate itself. It is mind boggling and the process to make a cell demands a Creator (The LORD) who knows a whole lot more about it than we do. And don’t forget, evolution claims that it all happened by itself. To believe that the chemical evolution of a cell occurred requires that no intelligence is allowed. Interesting double meaning in that last sentence. EVOLUTION is not about the origin of life, only what happens after. You don’t understand evolution. Answer here. Free course for High School Students: The Search for the Origin of Life by John Mackay and Diane Eager here. Ed Neeland is a Ph.D. synthetic organic chemist and associate professor of chemistry at the University of British Columbia Okanagan Campus. His research interests are developing new medicinal chemicals, and he knows from first hand experience how much design goes into even small organic molecules. Ed has given creation talks since 1990 and is particularly interested in the molecular evidence in nature as evidence supporting the Biblical creation model.